Here you will find information about the range of pressure relief mattresses you can select from, depending on the user’s level of risk. Independent Living has an area dedicated to general advice about pressure relief, Can you prevent pressure ulcers?. 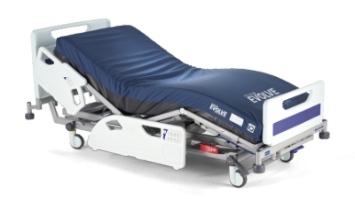 Current NICE guidance is that all vulnerable people, including those with a grade 1–2 pressure ulcer, should receive, as a minimum provision, a high specification foam pressure relief mattress, and the ulcer should be closely observed for deterioration. • the person is within the recommended weight range for the mattress. 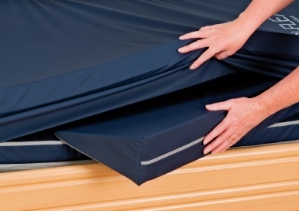 There is an extensive article explaining the relationship between pressure relief mattresses and overlays, and the incidence of bed falls in care home environments, here. For meeting the pressure management needs of patients weighing up to 455kg (71st), there is the Verto Turning Mattress from Benmor Medical (left). Seriously obese people are at greater risk of developing pressure ulcers. The gentle, gradual, 30-40 degree turning angle of the patient from side to side exerts less than 26mm Hg of pressure on the skin tissue and this allows the capillaries to fill, preventing blood starvation and pressure damage. In this way, existing pressure sores can also be treated successfully. Air escapes through tiny pinholes in the top of the cells to circulate under the cover. The moisture from the patient transfers through the vapour permeable fabric cover to interact with the air blowing up from the mattress. This process keeps the patient cool and dry without blowing air directly onto their skin. The TRI-FLEX pressure relief mattress system from Drive DeVilbiss Healthcare (shown right) addresses the prevalence of damage to the heels. It has been designed so that the heels can be elevated completely, in such a way as to distribute the weight of the leg along the calf without putting pressure on the Achilles tendon. 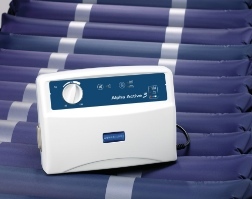 The design of the TRI-FLEX allows for complete freedom in positioning: interface pressures can be minimised in areas requiring protection by adjusting the shape of the mattress surface to take into consideration height, weight and additional health factors, such as oedema, pressure sores or other ulcerations. • Active/alternating mode: periodically redistributing pressure away from vulnerable areas, by alternately inflating and deflating cells beneath the resident/patient. Ideal for prevention of pressure ulcers in high risk residents/patients, particularly those cannot be frequently repositioned. • Reactive/static mode: cell pressure is equalised to redistribute the body weight over a greater surface area. Ideal for residents/patients in rehabilitation or those who cannot tolerate a moving surface. In addition to pressure beds, you can also obtain separate pressure relief mattresses or mattress overlays, which may be more cost-effective. Foam mattress overlays (right) may have a cross cut or textured upper surface to allow greater conformity. They can also reduce friction and shear by allowing the surface to move with the user. Foam can act as an insulator, raising the skin temperature, so a cross cut surface helps to counteract this by improving ventilation. Foam overlays need turning on a weekly basis and should be replaced regularly (every 6 – 9 months) as their performance deteriorates. Gel-filled supports address some of the problems inherent in foam; for example, they support the patient evenly across the horizontal plain without breaking down over time, and as the gel is designed to simulate the composition of human fatty tissue, it helps to reduce the sheer and friction that contribute to pressure sores. Gel doesn’t have the insulating properties of foam. There is more information about care beds in our specialist bed section. We also have an area dedicated to night-time sleep systems. 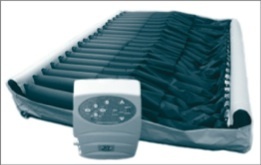 Use this form to send an email about Pressure Relief Mattresses to Independent Living. Your contact details will be held securely, so that we can reply to you and deal with your query.